Buenos Aires (English: Fair Winds; originally Ciudad de la Santísima Trinidad y Puerto de Santa María de los Buenos Aires, "City of the Most Holy Trinity and Port of Saint Mary of the Fair Winds"; pronounced [ˈbwe.nɔs ˈaj.ɾɛs]) is the capital of Argentina and its largest city and port. It is located on the southern shore of the Río de la Plata, on the southeastern coast of the South American continent, opposite Colonia del Sacramento, Uruguay, at 34°40′S 58°24′W (-34.667, -58.40). Spanish seaman Juan Díaz de Solís was the first European to reach the Río de la Plata, in 1516, but his expedition was cut short by an attack in which he was killed by the native Charrúa or Guaraní tribe. The city was first founded as Ciudad de Nuestra Señora Santa María del Buen Ayre (literally "City of Our Lady of the Good Air") on February 2, 1536 by a Spanish gold-seeking expedition under Pedro de Mendoza. The name was chosen by Mendoza's chaplain, who was a devout follower of the Virgine de Bonaria ("Our Lady of the Fair Winds") of Cagliari, Sardinia. The location of Mendoza's city was in today's San Telmo district, south of the city centre. More attacks by the indigenous peoples forced the settlers away and in 1541 the site was abandoned. A second (and permanent) settlement was established in 1580 by Juan de Garay, who sailed down the Paraná River from Asunción (now the capital of Paraguay). From its earliest days, the success of Buenos Aires depended on trade. During most of the 17th and 18th centuries, Spain insisted that all trade to Europe initially pass through Lima, Peru so that taxes could be collected. This scheme frustrated the traders of Buenos Aires, and a thriving contraband industry developed. Unsurprisingly, this also instilled a deep resentment in porteños towards Spanish authorities. Sensing this instability, Charles III of Spain progressively eased the trade restrictions and finally declared Buenos Aires an open port in the late 1700s. Those placating actions did not have the desired effect, and the porteños, some of them versed in the ideology of the French revolution, became even more desirous of independence from Spain. The Buenos Aires Cabildo, site of the 1810 May Revolution. During the British invasions of the Río de la Plata British forces invaded Buenos Aires twice in 1806–1807 but were repulsed by local militias. Ultimately, on May 25, 1810, while Spain endured the Peninsular War and after a week of mostly pacific deliberations, the criollo citizens of Buenos Aires successfully ousted the Spanish Viceroy and established a provisional government. That date is now celebrated as a national holiday ( May Revolution Day). Formal independence from Spain was declared only in 1816. Historically, Buenos Aires has been Argentina's main centre for liberal and free-trade ideas, while many of the provinces, especially to the Northwest, advocated a more conservative-Catholic approach to political and social issues. Many tensions within Argentine history, starting with the centralist-federalist conflicts of the 19th century, can be traced back to these contrasting views. In the 19th century the city suffered naval blockades on two occasions: first by the French, from 1838 to 1840, and then a joint Anglo-French blockade from 1845 to 1848. Both blockades failed to surrender the city, and the foreign powers eventually desisted from their demands. During most of the 19th century, the political status of the city remained a sensitive subject. 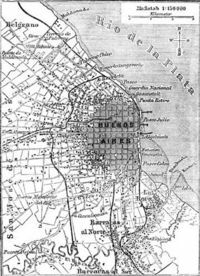 Meant by many to be the nation's capital, it was already capital of Buenos Aires Province, and for seven years from 1853 to 1860, it was the capital of the seceded State of Buenos Aires. The issue was debated more than once on the battlefield, until the matter was finally settled in 1880 when the city was declared national capital, separated from the province of the same name, and became the seat of the federal government, with its Mayor appointed by the President. Today, the Casa Rosada is the seat of national government and the office of the President of the Republic. Railroad construction near the end of the 19th century increased the economic power of Buenos Aires as raw materials flowed into its factories, and the town became a metropolitan and multicultural city that ranked itself with the major European capitals. For example, the Teatro Colón was one of the world's top opera venues. The city's main avenues were built in those years, and the dawn of the 20th century saw the construction of South America's then-tallest buildings and first subway network. By the 1920s Buenos Aires was a favoured destination for immigrants from Europe, as well as from the poorer provinces and neighbouring countries, and large shanty towns ( villas miseria) started growing around the city's industrial areas, leading to extensive social problems. Buenos Aires was the cradle of Peronism: the now-mythical demonstration of October 17, 1945 took place in Plaza de Mayo. Industrial workers of the Greater Buenos Aires industrial belt have been Peronism's main support base ever since, and Plaza de Mayo became the site for demonstrations and many of the country's political events. On June 16, 1955, the military uprising that would depose President Perón three months later (see Revolución Libertadora) had the Plaza de Mayo area bombed, killing 364 civilians (see Bombing of Plaza de Mayo). This was the only time the city was attacked from the air. In the 1970s, the city suffered from the fighting between left-wing revolutionary movements ( Montoneros, E.R.P. and F.A.R.) and right-wing paramilitary group Triple A, supported by Isabel Perón, who became president of Argentina in 1974, after Juan Perón's death. The military coup of 1976, led by Jorge Rafael Videla, only escalated this conflict; the " Dirty War" produced between 10,000 and 30,000 desaparecidos, people kidnapped and killed by the military during the years of the junta. By some estimates upwards of 100,000 people were held in illegal detention centers and concentration camps during those years. The silent marches of their mothers ( Mothers of the Plaza de Mayo) are a well-known image of Argentine suffering during those times. The city was visited by Pope John Paul II on two occasions: in 1982, due to the outbreak of the Falklands-Malvinas War, and a second visit in 1987, which gathered crowds never seen before in the city. On March 17, 1992 a bomb exploded in the Israeli Embassy killing 29 and injuring 242. Another explosion, on July 18, 1994, destroyed a building housing several Jewish organizations killing 85 and injuring many more (see AMIA bombing). In 1996, under the 1994 reform of the Argentine Constitution, the city gained autonomous status, and held its first mayoral elections (its formal title changed to "Chief of Government"). The winner was (later President) Fernando de la Rúa. On December 30, 2004, a fire at República Cromagnon concert hall killed almost 200 people, the greatest non-natural tragedy in Argentine history. Due to his responsibility over the non-enforcement of safety regulations, and (allegedly) also because of his precarious political standing, Mayor Aníbal Ibarra was impeached by the legislature, and deposed on 6 March 2006. His deputy, Jorge Telerman, who had been the acting mayor since December 2005, was invested with the office. De la Rúa's successor, Aníbal Ibarra, won two elections, but was impeached (and ultimately deposed on 6 March 2006) as a result of the fire at República Cromagnon concert hall, which killed almost 200 people. Jorge Telerman, who had been the acting mayor since December 2005, was invested with the office. Buenos Aires is represented in the Argentine Senate by three senators (as of August 2006, Rodolfo Terragno, María Leguizamón and Vilma Ibarra). In addition, Buenos Aires citizens elect 25 national deputies for the Argentine Chamber of Deputies. 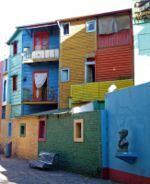 The colourful district of La Boca. The city is divided into 48 barrios (neighbourhoods) for administrative purposes. 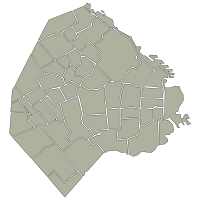 The division was originally based on Catholic parroquias ( parishes), but has undergone a series of changes since the 1940s. A newer scheme has divided the city into 15 comunas. 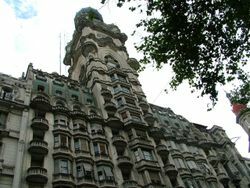 Some of the most iconic and best-known barrios include La Boca, San Telmo, Recoleta, Palermo and Puerto Madero. 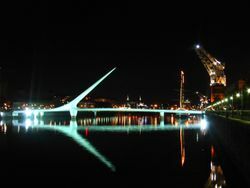 The people of Buenos Aires are known as porteños (people of the port), acknowledging the major historical importance of the port in the development of the city and the nation. Suburbanites are called porteños and sometimes bonaerenses (the demonym of the Buenos Aires province). According to the census, the city proper has a population of 2,776,138, while the Greater Buenos Aires conurbation has more than 12.4 million inhabitants ( 2001 census [ INDEC]). The population of the city proper has been stagnant since the late 1960s, due to low birth rate and a slow flight to suburbia. Most porteños have European origins, with Spanish and Italian descent being the most common, mainly from the Galician, Asturian, and Basque regions of Spain, and the Calabrian, Ligurian, Piedmont and Neapolitan regions of Italy. Other European origins include German, Portuguese, Polish, Irish, French, Croatian and English. In the 1990s, there was a small wave of immigration from Romania and Ukraine. There is a small minority of old criollo stock, dating back to the Spanish colonial days. Criollo and Spanish-aboriginal (mestizo) population in the city has increased mostly as a result of migration, both from the provinces and from nearby countries such as Bolivia, Perú and Paraguay, since the second half of the 20th century. 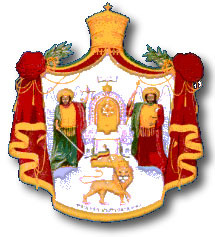 Important Arab (mostly Syrian-Lebanese) and Armenian communities have been significant in commerce and civic life since the beginning of the 20th century. Buenos Aires's Jewish community, numbering around 250,000, is the largest Jewish community in Latin America. Most are of Eastern European Ashkenazi origin, with a minority of Sephardim of mostly Syrian descent. The first major East Asian community in Buenos Aires was the Japanese, including a significant number from Okinawa; since the 1970s there has been an important influx of immigration from China and Korea (see also: Asian-Argentines). Most inhabitants are Roman Catholic. 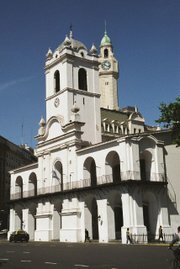 Buenos Aires is the seat of a Roman Catholic metropolitan archbishop (who is the prelate of Argentina), as well as of several Eastern Orthodox and Anglican hierarchs. Evangelical churches have steadily increased their ranks since the 1980s. Sizable Jewish and Muslim communities have existed in the city for over 100 years. Buenos Aires is home to Latin America's largest Jewish community. 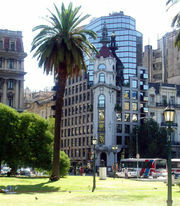 Buenos Aires is the financial, industrial, commercial, and cultural hub of Argentina. Its port is one of the busiest in the world. Tax collection related to it has caused many political problems in the past [*]; navigable rivers by way of the Rio de la Plata connect the port to north-east Argentina, Brazil, Uruguay and Paraguay. As a result, it serves as the distribution hub for a vast area of the south-eastern region of the continent. To the west of Buenos Aires is the Pampa Húmeda, the most productive agricultural region of Argentina (as opposed to the dry southern Pampa, mostly used for cattle farms). Meat, dairy, grain, tobacco, wool and hide products are processed or manufactured in the Buenos Aires area. Other leading industries are automobile manufacturing, oil refining, metalworking, machine building, and the production of textiles, chemicals, clothing, and beverages. 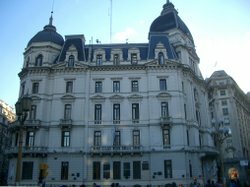 1923 Barolo Palace, on Avenida de Mayo. The Nueve de Julio Avenue, the world's widest street. Its name honours Argentine Independence Day (July 9, 1816). Deeply influenced and self-consciously modeled after its European heritage, Buenos Aires is the site of the Teatro Colón, one of the world's greatest opera houses. There are several symphony orchestras and choral societies. The city has numerous museums related to history, fine arts, modern arts, decorative arts, popular arts, sacred art, arts and crafts, theatre and popular music, as well as the preserved homes of a number of art collectors, writers, composers and artists. It harbours many public libraries and cultural associations as well as the largest concentration of active theatres in Latin America. It has a world-famous zoo and Botanical Garden, a large number of landscaped parks and squares, as well as churches and places of worship of all denominations, many of which are architecturally noteworthy. Argentines refer to their dialect of Spanish as castellano ( Castilian), which in Buenos Aires (and also in other cities like Rosario and Montevideo, Uruguay) is characterised by voseo, yeísmo and aspiration or loss of syllable-final -s. Heavily influenced by the dialects of Spanish spoken in Andalusia and Murcia, it is sometimes known as Rioplatense Spanish. The lunfardo argot originated within the prison population, and in time it spread to all porteños. Lunfardo uses words from Italian dialects, from Brazilian Portuguese, from African and Caribbean origin and even from English; and employs humorous tricks such as inverting the syllables within a word (see vesre). Today, lunfardo is mostly heard on tango lyrics; the slang of the younger generations has been evolving away from it. In the early 20th century, Argentina absorbed millions of immigrants, many of them Italians, who spoke mostly in their local dialects (mainly Neapolitan, Sicilian and Genoan). Their adoption of Spanish was gradual, creating a pidgin of Italian dialects and Spanish called cocoliche, widely heard in the beginning of the 20th century; its usage declined around the 1950s, and today survives mostly as comic relief. As many Spanish immigrants were from Galicia, to the extent that Spaniards are still generically called gallegos (Galicians), Galician language, cuisine and culture had a major presence in the city for most of the 20th century. In recent years, descendants of Galician immigrants have led a mini-boom in Celtic music (which also highlighted the Welsh traditions of Patagonia). Yiddish was commonly heard in Buenos Aires, especially in the Balvanera garment neighbourhood and in Villa Crespo, until the 1960s. Korean and Chinese have become significant since the 1970s. Most of the newer immigrants learn Spanish quickly and assimilate into city life. Tango in the streets of Buenos Aires. Starting in the 1920s, the Buenos Aires style of tango music evolved into an elaborated genre. In its heyday, tango had many famous orchestras such as those led by Aníbal Troilo and Juan D'Arienzo, and singers such as Carlos Gardel and Edmundo Rivero. Tango enjoyed a resurgence in global popularity later in the century due almost exclusively to Astor Piazzolla and his development of the tango nuevo style. 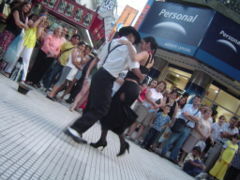 In San Telmo, Sundays are devoted to tango shows on the streets and antiques trade in the bazaars around Dorrego Square. Tango shows can be found in establishments such as Rivero's El Viejo Almacén. The city has many museums, historical buildings, shopping centres, hotels and a floating casino. A majority of residents in Buenos Aires and its suburbs use public transportation. A Buenos Aires invention is the " colectivo", popularly known as the "bondi", a small bus built out of a truck chassis and seating 21 to 27. Numerous colectivos and larger public buses traverse the city each hour providing access to virtually all neighborhoods. The Buenos Aires Metro (locally known as el subte, from "subterráneo" meaning "underground") is an extensive system providing access to various parts of the city. Opened in 1913, it is the oldest subway system in the Southern Hemisphere and in the Spanish-speaking world. The system has five lines, A to E, 80 stations, and 46 km of track. Under an expansion program, it is expected to expand to 89 km by 2011. Buenos Aires used to be relatively congestion-free for a city of its size. Toll freeways opened in the late 1970s by then-mayor Osvaldo Cacciatore provided fast access to the downtown area, increasing the number of cars coming into the city. During Cacciatore's tenure, the streets of the downtown financial district (roughly one square kilometre in size) were declared off-limits to private cars during daytime. 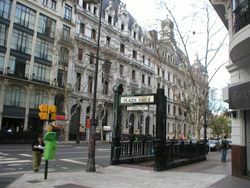 Main avenues of the city include the 140-m-wide 9 de Julio Avenue, the over-35-km-long Rivadavia Avenue, and the cultural-centred Corrientes Avenue. Following the economic mini-boom of the 1990s, more people started commuting by car, and congestion increased. Most major avenues are gridlocked at peak hours. Another source of congestion is the flight of many people to the country on weekends. Black-and-yellow taxis roam the streets at all hours. Some of these are unlicensed (controls are not fully enforced), so visitors are advised to phone a reputable radio-link company. Low-fare limo services, known as remises, have become more popular in recent years. All of Argentina's extensive railway network converges on Buenos Aires. The three principal stations for both long-distance passenger services and commuter trains are Estación Retiro, Estación Constitución, and Estación Once. There is a project to build a Buenos Aires-Rosario-Córdoba high-speed railway, which would join the three most populated cities in Argentina. Bids were opened in mid-2006, and proposals by four European firms are under study. Construction is slated to start in 2007, to be finished in 2010. The Buenos Aires international airport, Ministro Pistarini International Airport, is located in the suburb of Ezeiza and is often called simply "Ezeiza". The Aeroparque Jorge Newbery airport, within city limits near the river, serves mostly domestic traffic. 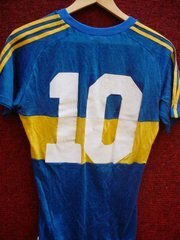 Diego Maradona's Boca Juniors shirt. Football is a passion for Argentines. Buenos Aires has the highest concentration of football teams of any city in the world, with many of its teams playing in the major league. The best-known rivalry is the one between Boca Juniors and River Plate, and a match between these two teams has been qualified as "the Nº 1 sporting event to watch before dying" by The Observer. Other major clubs include San Lorenzo de Almagro, Vélez Sársfield and Club Atlético Huracán, of Parque Patricios. Diego Armando Maradona, who was born in a poor suburb of Buenos Aires and is widely hailed as one of the greatest football players ever, started his career with Argentinos Juniors and later played for Boca Juniors (he also played for other clubs, notably Italian side SSC Napoli). Buenos Aires has been a candidate city for the Summer Olympic Games on three occasions: for the 1956 Games, lost by a single vote to Melbourne; for the 1968 Summer Olympics, which were held in Mexico City (to this date, the only Games held in Latin America); and in 2004, when the games were awarded to Athens. As of 2006, Argentina is the only founding member of the International Olympic Committee that has not hosted the games. However, Buenos Aires hosted the 1951 Pan American Games - the first, and was also host city to several World Championship events: the 1950 and 1990 Basketball World Championships, the 1982 and 2002 Men's Volleyball World Championships and, most remembered, the 1978 FIFA World Cup, won by Argentina on June 25, 1978 when it defeated the Netherlands by 3–1. The Buenos Aires Oscar Gálvez car-racing track hosted 20 editions of the Formula One Argentine Grand Prix between 1953 and 1998; its discontinuation was due to financial reasons. The track features local categories on most weekends. Juan Manuel Fangio is considered one of the greatest figures in the history of Grand Prix racing. Other notable Argentine drivers include José Froilán González and Carlos Reutemann. Buenos Aires native Guillermo Vilas (who was raised in Mar del Plata) was one of the great tennis players of the 1970s and 1980s, and popularized tennis in all of Argentina. Other popular sports in Buenos Aires are golf, basketball, rugby, and field hockey. Buenos Aires ISPs provide dial-up, cable, satellite-based and ADSL connections to the Internet. Suburban users routinely experience lower ADSL speeds, but their situation is improving steadily as investment in new facilities has been stepped up. The Internet boom in the early 2000s gave birth to cibercafés. There is a growing number of wi-fi hotspots, mostly around the downtown area.